You can’t go wrong with a chocolate anything recipe for dessert but THIS recipe is amazing! it’s kosher for Passover and gluten free too. 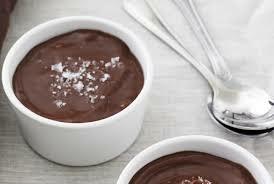 In a saucepan over low heat, gently melt the chocolate and cool to room temperature. Add the olive oil and the scraped vanilla bean and coffee and set aside. Combine the yolks and confectioners' sugar and whisk until foamy. Add to the chocolate mixture. In the bowl of a stand mixer fitted with a whisk attachment, beat the whites to stiff but glossy peaks; fold the whites into the chocolate. Pour into dessert cups and chill at least 4 hours or pour into a parchment or plastic lined mold and freeze for four hours. You can garnish the mousse with a sprinkle of sea salt. The salt gives the chocolate a "sparkly" flavor. Purchase the best quality extra virgin olive oil you can find. For this recipe, Chef Frankel uses an oil from France that is buttery, fruity, and rich with no harsh taste of bitterness. It is expensive--but since the olive oil is her fat of choice for all her pareve and fleishig meals during the holiday and year round, it is worth it. During Pssover, she uses Schmerling's 70% Bittersweet Chocolate. When Passover is over, she uses Callebaut 71% Bittersweet Chocolate.